Sales of used Class 8 trucks dropped amid ongoing tight inventory in February and high demand as the average truck’s price climbed above $48,000, ACT Research Co. reported. There were 19,500 Class 8s sold compared with 21,900 a year earlier, according to ACT, which surveys dealers, wholesalers and auctioneers as well as a few large fleets to determine average prices, age and mileage, and volumes. Year-to-date, 41,000 Class 8s have been sold compared with 45,900 a year earlier, according to ACT. The average price rose to $48,173 compared with $41,995 in the 2018 period — when prices still were ramping up and so offer easy comparisons. ACT Vice President Steve Tam noted of the year-over-year decline that 2018, with an estimated 280,000 sales, was the strongest period for used Class 8 sales since ACT started tracking them in 2003. “Overarching, I still think 2019 is going to be a solid year for the used truck market, but it is not going to be a record year. We are coming off that peak,” he said. 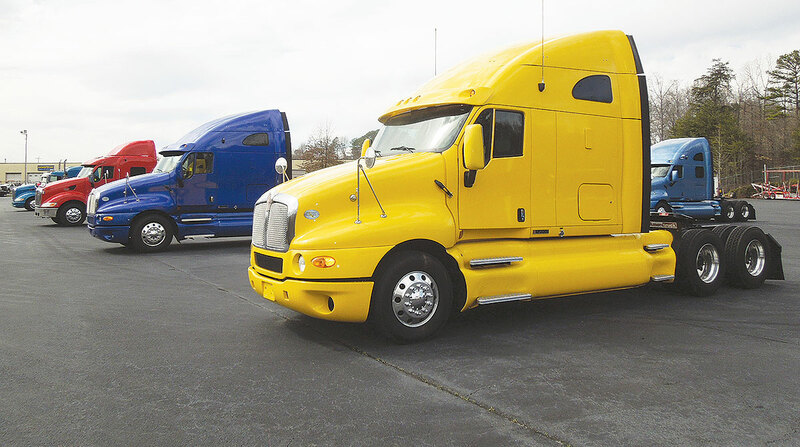 In the meantime, the industry has benefited from lower-than-normal depreciation in the used truck market,“but we are headed for something that more closely resembles normal depreciation,” Tam said. Mileage on the average Class 8 in February was 444,000, down from 451,000 a year earlier. “We are still benefiting from trucks that have a little bit more usable life in them, which supports that pricing dynamic,” he said. The average age increased slightly to 6 years, 11 months. That compared with 6 years, 10 months in the 2018 period. Meanwhile, one financial analyst surveyed 20 Freightliner dealers recently. “Class 8 used-truck inventory levels are still low on average at the Freightliner dealers we surveyed as 70% of contacts indicated that their used-truck inventory levels are too low, 20% ideal and 10% too high,” Neil Frohnapple, director of equity research for The Buckingham Research Group, wrote in a note to investors. “Dealers noted that there has been continued strong demand from owner-operators and small fleets for used trucks in the first quarter. However, dealers also noted they are still worried about the significant amount of trade-ins expected as fleets purchase new trucks,” he added. Another analyst wrote that the state of the economy — including consumer spending, manufacturing activity, and imports and exports — is the key to used truck values. “This time around, any downturn in used truck values will hinge more on economic conditions than supply of incoming trades,” Chris Visser, senior analyst for commercial vehicles at J.D. Power, wrote in a recent blog. Also in February, the average sleeper tractor retailed was 5 years, 9 months old, had 470,528 miles and brought $55,817. Compared with February 2018, this average sleeper was identical in age, had 12,211, or 2.7%, more miles, and brought $7,225, or 14.9% more money, according to Visser.